Cranberry Apple Crumble – A warm dessert made with seasonal flavors of cranberry and apple and topped with crunchy brown sugar crumbles. The only thing that can make this dessert even better is a generous scoop of vanilla ice cream! Apple pie. It’s a staple almost all year long. When 4th of July comes around, everyone and their mom is making an apple pie. What’s more American than a apple pie and a scoop of vanilla ice cream?! And here we are in fall and, again, apple pies are steeling the show. Almost every Thanksgiving we’ve ever had required an apple pie. Which explains why apple pie was the first pie I ever made. Now, 15 years after my first pie attempt, and I’ve become so annoyed with making pie. There are soooo many steps: make dough, chill dough, roll out dough, make filling, make pretty top crust, bake. It’s just too much, especially during this busy time of year. But the stress doesn’t end there…now you gotta slice it. The first slice I cut NEVER comes out pretty. I usually keep the first slice for myself to save the embarrassment when I hand over a gloop of apple pie filling with the crust in shambles. This is also the exact reason why I love making hand pies like this one and this one. All of this leads me to today’s discussion. Today I want to talk about one of my favorite alternatives to traditional apple pie: apple crumbles. What is an apple crumble? It’s just like an apple crisp, but the topping is just buttery, cinnamon brown sugar and contains no nuts or oats. I don’t need all that extra healthy stuff distracting me. It’s the same balance of carbs and fruit that you crave in a pie but with so much less effort since it takes 1/2 the time to make and is scoopable, thus no messy slicing! Hallelujah! The version I’m sharing today is a cranberry apple crumble. Yummm. I have been embracing cranberries a lot more this year. And I am so glad I did! They pair so beautifully with apples so adding them to this crumble was a no-brainer. Plus, the festive flavors (and colors!) make this crumble the perfect dessert for all your holidays meals. The apples and cranberries release tons of juices when cooking. When those juices mix with the sugars and flour, they thicken up to make a creamy, custard-like filling that can only be made better with the crispy, crunchy topping of brown sugar and cinnamon. Oh and don’t forget the ice cream on top! Make sure to slice the apples, not dice them. I think it makes for a better balance of the apple to cranberry ratio when you serve it. You can use either frozen or fresh cranberries. Do not use dried cranberries. You won’t get any juices from those and thus no thick, custard-like filling. It will be dry and boring. Yuck! Let the crumb mixture chill in the fridge for at least 10 minutes so it can harden up. I like to do this step before I core and peel the apples so it has plenty of time to chill. If the crumb mixture doesn’t get a chance to chill, it will melt into one big crust when it’s baked. I recommend granny smith apples for this crumble since they hold their texture very well. Other apples with too much water will get mushy and won’t taste so great. So do your research if you want to use another kind of apple to make sure they will hold up well when cooked. What other alternatives to pie do you love during this time of year? Let me know in the comments below! A warm dessert made with seasonal flavors and topped with crunchy brown sugar crumbles. The only thing that can make this dessert even better is a generous scoop of vanilla ice cream! Preheat oven to 375 degrees. Grease a 9x13 baking dish (or equivalent capacity) with butter or cooking spray. Mix sugars, cinnamon, nutmeg, and salt together in a medium bowl with a spoon or spatula. Add melted butter and combine. Add flour, 1/3 cup at a time until all combined. The mixture will resemble a paste. Don't worry, we will make it look like crumbs after it chills. Place in refrigerator to chill until you need it. Add flour, sugars, cinnamon, nutmeg and orange zest to a large bowl. Stir or whisk so the mixture is combined. Add apples and cranberries. Toss with a large spoon so that they are evenly coated in the mixture. Place into greased baking dish. Grab chilled crumb mixture from the refrigerator. Scoop a handful of the mixture from the bowl. Using both hands, crumble mixture evenly over the apple-cranberry mixture. Crumbs should be the size of peas but don't worry if they are some bigger and smaller than that. The topping actually looks better when the size of the crumbs are uneven. Repeat with the rest of the mixture. Place crumble into a preheated oven and bake for 40-50 minutes. You'll know it's done when the apples and cranberries are bubbling through the crumbs and the topping is deep, golden brown. Let mixture cool for 10 minutes. Scoop into dessert bowls or small plates and top with a scoop of vanilla ice cream (if desired). Store leftovers in refrigerator for up to 4 days. Do you have nutrition info like how many cal fat etc and can you use almond flour to make it gluten free? Sorry I don’t have nutritional info. And I think almond flour could work but I have never tried it so it’s hard to say for sure. Sorry I couldn’t be more help! Sharon, made this last night and it turned out amazing. Such a simple recipe and well written instructions made this a wonderful baking experience. The tartness of the cranberries and sweetened apples coupled with the crumble was right on the money. I wrote up my experience on my blog directing readers here if they want to learn how to whip this together! Nicely done! Thanks so much for the stellar review, David! Honored to be featured on you blog. Thanks for sharing! My 18yr baby girl/senior HS asked me to make “Apple cranberry crisp Like I used to” for “her maybe last ever Thanksgiving (yea, she gets that from me). I had a recipe that was my go to from Apple Pie to Waterzooi cookbook by the American Woman’s Club Brussels (@1997)… My daughter’s oat “intolerance” has increased and I just stopped making it. It was unfair to make it for parties if she couldn’t have. THANK YOU THANK YOU. Yay! I am excited for you to try this. 3 lbs is about 4 medium- sized apples or 4 cups of sliced apples. Let me know how you like it!! Everyone really loved this on Christmas Day. It was a great addition and perfect for the holidays. The filling was so yummy and I loved the crust part too. It’s good the next day reheated too. Thanks for the recipe, I’ll make this again! I am so happy to hear this Shannon! Thank you so much for sharing your experience. The recipe works great with other fruit too. I can’t wait to try with peaches and blueberries in the summer! I’m allergic to peaches but blueberries sound great! I’ll definitely be trying that. Another perfect dessert, Sharon. And those plates are the cutest! Aw thanks Jazz! You’re so sweet. And the plates are from Macy’s!! Oh my goodness! This looks fabulous! I wish I had seen this before Thanksgiving day! This would be the perfect dessert! These look sooo yummy! I was eyeing the cranberries at the store today, but I kept walking because I didn’t know what to do with them other than cranberry sauce (which I already have for T-day). Can’t wait to make these! Yay! Glad you have a reason to use them now! Wow this looks absolutely scrumptious! 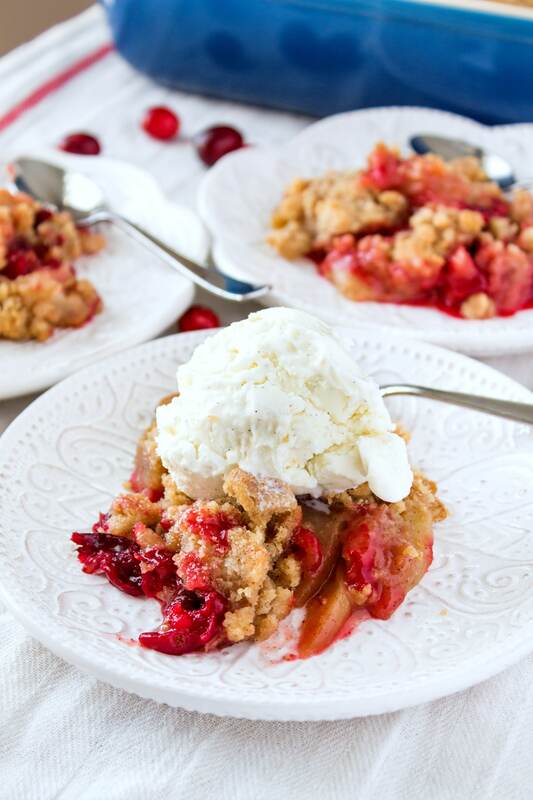 Love the idea of using cranberries to an apple crumble! Thanks Heather! The cranberries worked perfectly! Yum! I love apple crumble! Your comment about not wanting to distract yourself with the healthy stuff is hilarious! Hahaha thank you! I try to be funny. Glad it worked! hee hee! I was thrilled with this. this is healthy for our home because we have nut and oat allergies. I literally laughed out loud at “I don’t need all that healthy stuff distracting me.” Haha. Well said. Pinned! Haha thanks so much! I love when people get my humor! Mmh, this looks delicious! I will definitely have to try this! Thank you for sharing your recipe! Oh this is my new favorite website! Do you have any gluten free recipes? Yum! Aw thank you! All my soups and drinks are GF but sadly not many of the desserts are, except the candy ones (caramels and chocolate turtles). I do also have this sweet potato recipe and rice recipe that are amazing and GF. Let me know if there’s anything else you like and I can tell you how to make it GF. Thanks for your question! I am seriously drooling over here! Totally gonna bookmark this and make it! Thanks for the great recipe! I love apples and cranberries mixed together. Great recipe! This looks delicious! I do not have the patience to make apple pie and I don’t really like crumbles with oats, so this recipe was made just for me. Pinned and will have to make soon! OMG I’m drooling! How perfect for the holidays! Oh my jeeze! This can crumble into my mouth – ANY time! this recipe looks so good but omg my mouth is watering seeing those cinnamon rolls! I love apple crumble, and what a great idea to add cranberries too. A comforting winter dessert. Yes, the cranberries work so well in this crumble! This is a new type of crumble I have never made. Adding cranberries sounds pretty good. That’s awesome! I am glad to have introduced you! Yum!!!! This looks delicious, perfect for the holidays! I can’t wait to try it! A beautiful, delicious looking cranberry dessert! Sweet and utterly comforting food! Perfection. I prefer the consistancy of crumble to pie. This looks and sounds absolutely AMAZING! I love the cranberry-apple combo this time of the year! Thanks so much! It’s so perfect for this season, right? !